Modern Font Address Plaque - - meets 911 codes. Crisp Modern Font 4" numbers are easy to read. Wall mount. Made in USA. 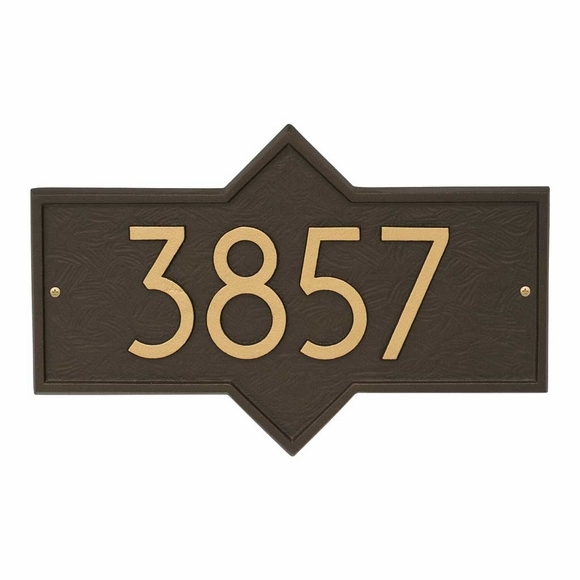 The hybrid rectangle shape, clean contemporary font, and on-trend color options make this house number sign big on curb appeal. Large image shown in aged bronze. Smaller images (from left to right) are black/silver, coastal clay, coastal green, oil rubbed bronze, pewter/silver, and white/black. Dimensions: 15.75"W x 10.25"H x .325. Personalized Address Plaque meets 911 codes. Crisp Modern Font 4" numbers are easy to read.